I had actually planned to write a mild, informative post on recent developments in software for writers. Instead, unfolding events compel a look at some atrocious happenings in the world and our so-called United States. Which to address: the looming, horrific use of nuclear weapons or the flagrant resurgence of right-wing ignorance and violence throughout this country? I’m going to opt for the latter, on the grounds that once nuclear weapons are flying again, blog posts, Facebook, Medium et al. will all become instantly irrelevant. Trump’s Twitter as well. You could argue they are already irrelevant, of course. But while there is still some degree of social structure and control in place, social media may have some role to play. Bear in mind, though, that both sides believe this. Hence the heading for this post—it’s not sufficient to opine or respond on social media alone. If you want to protect what’s good in our society, genuine action is required. 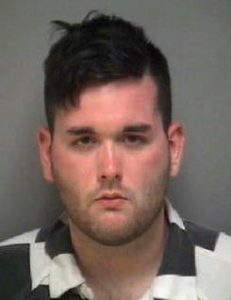 Murderous moron: James Alex Fields Jr. Photo: Charlottesville Police Department, via Reuters. Trump has encouraged, and thereby unleashed, a kind of hillbilly fascism at the grassroots level. We saw the most recent results in Charlottesville, VA this weekend: helmet-wearing thugs wielding various weapons to protest the removal of a statue honoring a 19th century racist and Civil War relic. Confederate flags and Nazi slogans were there in abundance, along with plenty of “Make America Great Again” merchandise. David Duke said “We’re going to fulfill the promises of Donald Trump” in order to “take our country back.” And Trump responded to the violence by decrying hatred on “many sides” (certainly his supporters cannot be asked to bear the blame alone). Band together. Not in small, local groups ringing doorbells but across states and regions. Progressive people must stand together regardless of location, and do so in big numbers. Push to form regional alliances: California, New York, New England, for example. These areas already cooperate closely on issues like the environment. Let’s push for cooperation on other major issues that cry out to be addressed. Urge the adoption of state-level legislation to form legally binding ties among these regional partners. If the South wants to secede again (and I say, let them), then progressives can respond by forming a sort of country within a country as a preliminary step toward building a new, blue America. The U.S. has never been truly united and it never will be. It’s time to acknowledge this. BTW, the newblueamerica.org domain is available and I’m available to help build a site there if others want to pitch in with money, resources and political connections in progressive states. It’s time to Think Different, as the late Steve Jobs once said about something much less important. Very little is working today, a great deal is broken. Catastrophe is barreling toward us on multiple fronts. Keeping one’s head down and going with the flow is only inviting disaster. We need to start thinking about big, unconventional change outside the normal political boundaries, and working to achieve it, before it’s too late. Author tpletcherPosted on August 13, 2017 October 21, 2017 Categories Politics/HistoryTags alt-right, Charlottesville, fascism, Trump, white supremacyLeave a comment on Do Something!